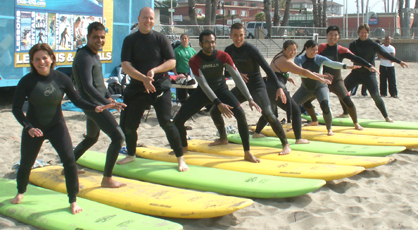 Almost all of the people you will see pictured below had never tried surfing before this lesson. 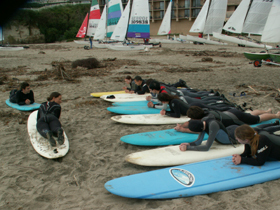 Please note that he rental wetsuit (included with the lesson) goes on with the zipper in the back. 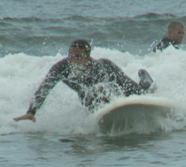 We’ve done this at least yearly for over ten years. The instruction is excellent and a lot of laughs. 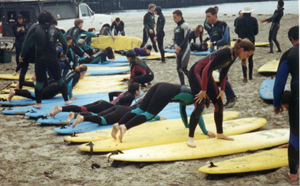 We start with a full lesson on the beach, including surfing right-of-way, etiquette, surf break awareness, wave formation, and practice standing up/proper stance on the boards. 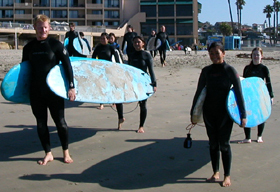 The instructors, about one per five or six students for our group event, go out in the water with us and help people, especially with the timing of when to paddle and when to stand up. 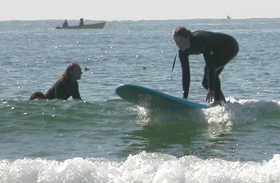 You will be on your board in position, the instructor will see when the wave is right and tell you to start paddling and then yell when it is time to attempt to stand up. 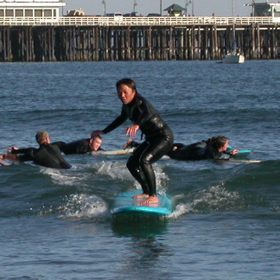 Some people really don’t stand up and surf, but everyone at least gets a few rides kneeling. 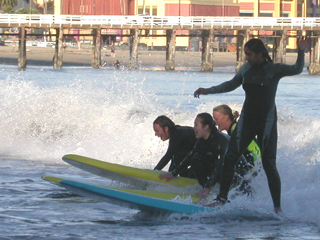 In the photo below you can see people waiting for a wave in the background, one student standing and surfing, one trying to get up, some paddling back after a ride, and one of the instructors (wearing a hat) with a student, helping them to stand. 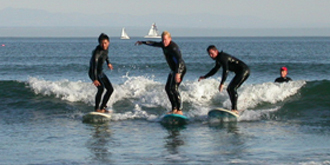 To participate in the surfing lessons you must pass a swim test: with a lifeguard or swim instructor assigned by the Outdoor Club watching you, jump into a corner of the diving well (deep pool), before you surface swim two full body lengths underwater, surface and tread water (not a flutter kick) for thirty seconds, then swim a minimum 35 yards head-up crawl or head-up breaststroke (swim along the side across the pool and back to where you started) (all this without stopping and/or holding on to the side of the pool). 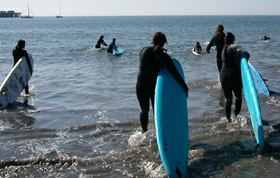 Instead of taking the swim test, you can provide a current Red Cross or YMCA lifeguard card or scuba certification or a note from a De Anza swim instructor that shows you are enrolled in a deep water swim class (not deep water running) when you sign up to prove that you can swim. Thinking about going on this adventure? 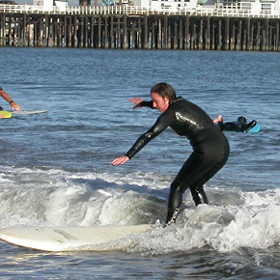 You will have more fun (and be safer) if you read all of this webpage, and read a sample trip agreement in advance of coming to sign up, so things can go faster. 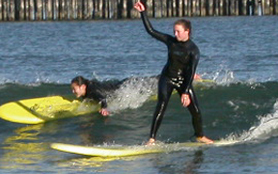 To better be able to find the lesson, use Google Maps to look for Cowell Beach, Santa Cruz and print yourself a map.